Paul closes out the book of Colossians by mentioning 9 fellow workers by name. Paul is not shy about the love he has for these people. He sends Tychicus to find out about them. He describes Tychicus as a beloved brother, a faithful minister and a fellow servant. He then goes on to mention Onesimus and describes him as a faithful and beloved brother. He goes on to talk about the others and how there is this interconnected concern that is expressed not only in letters but through constant prayers for each other. Paul values people and relationships. This passage reminds me that the people God has put around me are important and I should not take this blessing for granted. The greatest fellowship we have is with those who join us in serving the Lord. God is so good to surround me with great people. I truly love them and thank God for the great fellowship we enjoy. God often brings people to my mind for prayer. Emails are a great way for me to pray for special requests. Our prayers for each other really do make a difference. Well we have almost made to the end of our iTrain exercise. I have very much enjoyed this. I hope this has helped to establish your more firmly in your discipline of daily personal devotion. It has helped me stay on track personally. Your comments have been great to read. I don’t know that I have ever been a part of a personal devotion group like this before. I loved it. Thanks for coming along on this journey. I will miss this when we are done. We should always be mindful of the ways of God. 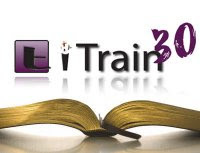 Asking the Lord for guidance, seeking his patch for our lives...the itrain 30 devotionals have really helped me grow closer to God (and I know from James 4:8 that He will draw closer to me). Thank you Pastor Eddie for your time and dedication in leading this for us. I am so grateful for the experience. Thanks for sharing your devotions, they have been helpful reminders. We appreciate all that you do.